Wax Roses are made of wood and they last a pretty long time. They are triple dipped in wax to ensure you an amazing smell for a long time! Each set can last about 6 months to a year. The only thing that you would have to do with the roses each month is heat them gently with a hair dryer for the aroma to fill the air. Each set comes in 6 different colors; white, lavender pink, red, yellow, and light blue. Each set (1 dozen roses) come in an elegant box and the roses come with a bow wrapped around the stems. There is also a special surprise with ever set of roses! 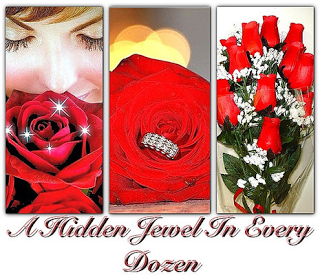 Each dozen comes with a hidden jewel with a value from $10 to $7500! You never know what you are going to get! Can you imagine giving this to that someone special and then they see the beautiful jewel that comes with them? One lucky winner will be receiving a dozen wax roses with a hidden jewel inside! Giveaway is open to the US, 18+. Will run from January 22nd at 7 pm until February 6th, 2013. Enter the Giveaway Tool form below for your chance to win. Good Luck! Jewelry Candles Prize Pack! 3 Winners! 3 Prizes Each! These roses look really wonderful! And a jewel!! Wow, I would love to win this for myself. These roses look really wonderful – and a jewel! Wow, I would love to win this for myself!! I have already thought of a special place for these if I win. I would probably keep them.